Watch White House Down cheaply on Amazon or read more articles on film and television. You too can earn money from writing articles by signing up for InfoBarrel. In White House Down John Cale (Channing Tatum) is a former Silver Star awarded member of the US Army who served multiple tours in Afghanistan who, after leaving the army, joined the U.S. Capitol Police (a US law enforcement agency that protects the US Congress) and is now assigned to protect the Speaker of the House Eli Raphelson (Richard Jenkins). Cale is attempting to join the United States Secret Service and visits the White House to apply for a job with them. He takes his daughter Emily (Joey King, Oz the Great and Powerful) with him for a tour, as she is interested in politics. Credit: http://en.wikipedia.org/wiki/File:White_House_Down_Theatrical_Poster.jpgThere is an explosion at the Capitol Building under the dome, which turns out to be a distraction from the main objective - an attack on the centre of government itself. Cale and his daughter are trapped inside the building, along with US President James W. Sawyer (Jamie Foxx, Miami Vice, The Amazing Spider-Man 2) and a number of other hostages, as a paramilitary group seizes control. Cale is separated from his daughter and manages to escape from the hostage takers custody. He needs to rescue his daughter, and free the President from the attackers too. Not everything is as it seems, for the terrorists gained surprisingly easy access to what is supposedly the most heavily defended building on the planet. This isn't the first time that Roland Emmerich has left the White House the worse for wear, as he destroyed it with a giant alien super laser in Independence Day (which scene is actually referred to in this film) and crushed it with the aircraft carrier USS John F. Kennedy in 2012. This is not even the first time this year that the White House has been captured by terrorists. There are elements of humour scattered throughout the film, such as the video navigation system in a limo actually showing attacking zombies and helicopters setting off speed cameras, although this isn't an action comedy. These lements do add moments of levity to the film. This is mostly an action film rather than anything else though. The terrorists aren't your traditional terrorists either; many of them don't even seem to qualify as such. Ruthless and violent yes, but rather different from the norm. This is certainly not a masterpiece or a particularly in-depth film, but it is entertaining enough, especially if you want to see parts of the White House being destroyed for the second time this year. Guns, helicopters, a tank, explosions and a slightly silly if bullet strewn chase on the front lawn of the prevail throughout the film. 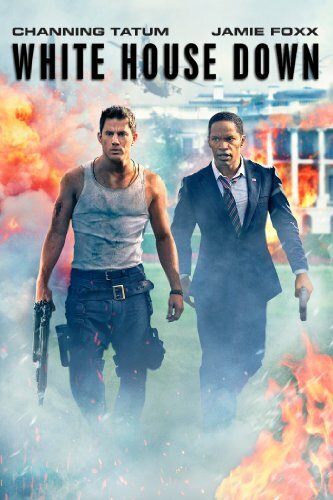 Tatum does a decent enough job at the action man role; Foxx is rather less believable as the President of the United States, as he appears to be more of an occasionally comic sidekick than anything else. White House Down is a decent, if not overly thoughtful action film, although there are some parts which seem to be designed to make you think.